Illustrating further the integrity of the Great Powers, the late Chris Harman adds that ‘the rulers of Western “democracies” were content for Hitler and Mussolini to flout a “non-interventionist” pact, since Franco was no danger to their empires.’ In fact, along with Franco, Churchill also defended Stalin during Cabinet meetings, with the actions of both dictators qualifying them to be the prime minister's ‘kind of guys,’ in Obama-speak. We are not a young people with an innocent record and a scanty inheritance. We have engrossed to ourselves an altogether disproportionate share of the wealth and traffic of the world. We have got all we want in territory, and our claim to be left in the unmolested enjoyment of vast and splendid possessions, mainly acquired by violence, largely maintained by force, often seems less reasonable to others than to us. Everything was put into the common pool with the exception of clothing, furniture, personal savings, small domestic animals, garden plots, and poultry kept for family use. Artisans, hairdressers, shoemakers, etc., were grouped in collectives; the sheep belonging to the community were divided into flocks of several hundreds, put in the charge of shepherds, and methodically distributed in the mountain pastures. ... It appears that the units which applied the collectivist principle of day wages were more solid than the comparatively few which tried to establish complete communism too quickly, taking no account of the egoism still deeply rooted in human nature, especially among the women. In some villages where currency had been suppressed and the population helped itself from the common pool, producing and consuming within the narrow limits of the collectives, the disadvantages of this paralyzing self-sufficiency made themselves felt, and individualism soon returned to the fore, causing the breakup of the community by the withdrawal of many former small farmers who had joined but did not have a really communist way of thinking. Bakunin’s ‘instinct for freedom’ was deep in the minds of the country's peasants when the opportunity for revolutionary change arose. They did not need to be lectured on how to treat each other properly. 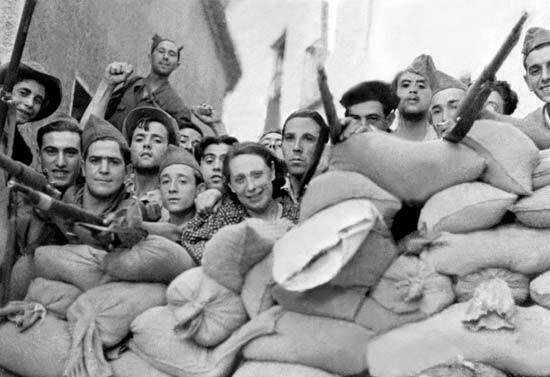 The Spanish Civil War, along with the Israeli kibbutzim and many other examples, seems to me strong evidence of the innate decency and solidarity of human nature, which is yet to be rid of all oppressive authority which cramps the liberation of its personality and creativity.